Like the rest of our body, our teeth and jaw joints age and change based on our diet, exercise routine and overall physical condition. Your individual dental symptoms and conditions are linked to key characteristics about your lifestyle and medical history. Check out the AGD Patient Education site to learn more about how to care for your smile from childhood through adulthood. Prevention and Diagnosis begins with the details. We have developed simple screening forms to assist us in obtaining your background and lifestyle information. Please take a moment to download and complete these forms and bring them along to your appointment. 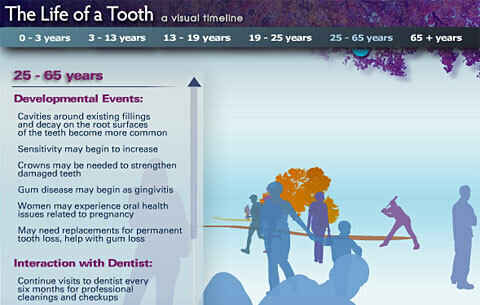 Determine your risk for cavities. Determine your risk for gum disease. Determine your risk for Oral Cancer. Do you suffer from jaw joint pain or unexplained headaches? You may suffer from TMJ dysfunction. Complete our screening form.